The Giant Sequoia (Sequoiadendron giganteum) is the largest tree in the world in terms of total volume. Trees are the largest plants. They are not a single taxon (unit of biological classification) but include members of many plant taxa. A tree can be defined as a large, perennial (living more than one or two years), woody plant. Although there is no set definition regarding minimum size, the term generally applies to plants at least 6 meters (20 feet) high at maturity and, more importantly, having secondary branches supported on a single, woody main stem or trunk. Compared with most other plant forms, trees are tall and long-lived. A few species of trees grow to 100 meters tall, and some can live for several thousand years. Trees are important components of the natural landscape and significant elements in landscaping and agriculture, supplying orchard crops (such as apples and pears). Trees are important for other plants, for animals, and for the entire web of life on earth, including humans. Trees also play an important role in many of the world's religions and mythologies. As plants that span many different orders and families of plants, trees show a wide variety of growth form, leaf type and shape, bark characteristics, reproductive structures, and so forth. The basic parts of a tree are the roots, trunk(s), branches, twigs, and leaves. Tree stems consist mainly of support and transport tissues (xylem and phloem). Xylem is the principal water conducting tissue, and phloem is the tissue that carries organic materials, such as sucrose. Wood consists of xylem cells, and bark is made of phloem and other tissues external to the vascular cambium. Trees may be broadly grouped into exogenous and endogenous trees according to the way in which their stem diameter increases. Exogenous trees, which comprise the great majority of modern trees (all conifers and broadleaf trees), grow by the addition of new wood outwards, immediately under the bark. Endogenous trees, mainly in the monocotyledons (e.g. palms), grow by addition of new material inwards. As an exogenous tree grows, it creates growth rings. In temperate climates, these are commonly visible due to changes in the rate of growth with temperature variation over an annual cycle. These rings can be counted to determine the age of the tree, and used to date cores or even wood taken from trees in the past; this practice is known as the science of dendrochronology. In some tropical regions with constant year-round climate, growth is continuous and distinct rings are not formed, so age determination is impossible. Age determination is also impossible in endogenous trees. 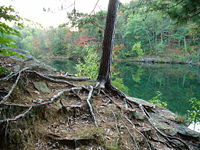 The roots of a tree are generally embedded in earth, providing anchorage for the above-ground biomass and absorbing water and nutrients from the soil. Above ground, the trunk gives height to the leaf-bearing branches, aiding in competition with other plant species for sunlight. 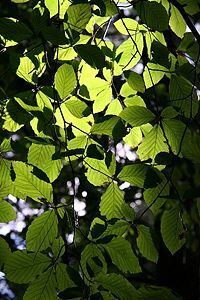 In many trees, the arrangement of the branches optimizes exposure of the leaves to sunlight. Not all trees have all the plant organs or parts mentioned above. For example, most palm trees are not branched, the saguaro cactus of North America has no functional leaves, and tree ferns do not produce bark. Based on their general shape and size, all of these are nonetheless generally regarded as trees. Indeed, sometimes size is the more important consideration. A plant form that is similar to a tree, but generally has smaller, multiple trunks and/or branches that arise near the ground, is called a shrub. However, no sharp differentiation between shrubs and trees is possible. Given their small size, bonsai plants would not technically be "trees," but one should not confuse reference to the form of a species with the size or shape of individual specimens. A spruce seedling does not fit the definition of a tree, but all spruces are trees. Bamboos by contrast, do show most of the characteristics of trees, yet are rarely called trees. The earliest trees were tree ferns and horsetails, which grew in vast forests in the Carboniferous Period; tree ferns still survive, but the only surviving horsetails are not of tree form. Later, in the Triassic Period, conifers, ginkgos, cycads, and other gymnosperms appeared, and subsequently flowering plants (or angiosperms) appeared in the Cretaceous Period. 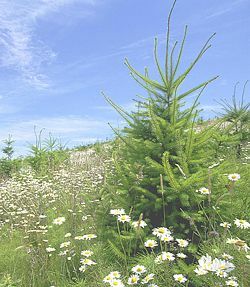 Angiosperms (such as an apple tree) have their reproductive organs in flowers and cover their seeds in a true fruit, whereas gymnosperms bear their seeds on the scales of a cone or cone-like structure (such as a spruce tree). Most trees today are classified as either broadleaf or conifer. Broadleafs (Dicotyledons or "dicots") are flowering plants which bear two-lobed seeds inside of fruits or seed cases. They include oaks, willows, apple trees, magnolia, eucalyptus, and many others. Broadleafs grow mainly from the tropics through the temperate zones in both the Southern and the Northern hemispheres. Most in the tropics and subtropics are evergreen, keeping their leaves until new ones replace them; while most in colder regions are deciduous, losing their leaves in fall and growing new ones in spring each year. Conifers are gymnosperms. They do not have true flowers and bear their single-lobed seeds "naked," not covered in a fruit or seed case. In most cases, their leaves are small and needle-like. They include pines, firs, cypresses, and others. Most conifers grow in the Northern Hemisphere, from the temperate zone north to around the Arctic Circle. Almost all of them are evergreen. 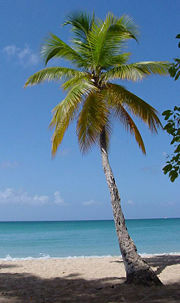 Palms are the third largest tree group. They are also a type of angiosperm or flowering plant, and specifically Monocotyledons or monocots, meaning they have one cotyledon, or embryonic leaf, in their seeds (unlike Dicotyledones, which typically have two cotyledons). They grow mostly in the tropics and are distinctive for lack of branches and the large leaves growing directly from the top of the trunk, as well as for growing new material inward. Smaller tree groups include members of the Agave family and the Cycad family and the ginkgo and tree ferns. The saguaro cactus and some species of bamboo (a grass) are sometimes considered to be trees because of their size. In botany, deciduous plants, principally trees and shrubs, are those that lose all of their foliage for part of the year. 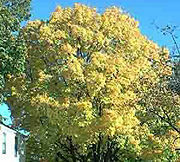 In some cases, the foliage loss coincides with the incidence of winter in temperate or polar climates, while others lose their leaves during the dry season in climates with seasonal variation in rainfall. The converse of deciduous is evergreen. Many deciduous plants flower during the period when they are leafless, as this increases the effectiveness of pollination. The absence of leaves improves wind transmission of pollen in the case of wind-pollinated plants, and increases the visibility of the flowers to insects in insect-pollinated plants. This strategy is not without risks, as the flowers can be damaged by frost, or in dry season areas, result in water stress on the plant. An evergreen plant is a plant that retains its foliage all year round. Leaf persistence in evergreen plants may vary from a few months (with new leaves constantly being grown and old ones shed), to only just over a year (shedding the old leaves very soon after the new leaves appear), up to a maximum of several decades, such as 45 years in Great Basin Bristlecone Pine Pinus longaeva (Ewers and Schmid 1981). However, very few species show leaf persistence of over 5 years. In tropical regions, most rainforest plants are evergreen, replacing their leaves gradually throughout the year as the leaves age and fall, whereas species growing in seasonally arid climates may be either evergreen or deciduous. Most warm temperate, climate plants are also evergreen. In cool temperate climates, fewer plants are evergreen, with a predominance of conifers, as few evergreen broadleaf plants can tolerate severe cold below about -25°C. A small group of trees growing together is called a grove or copse, and a landscape covered by a dense growth of trees, in which they are the dominant influence, is called a forest. Several biotopes (an area of uniform environmental, physical conditions providing habitat for a specific assemblage of plants and animals) are defined largely by the trees that inhabit them; examples are rainforest and taiga. A landscape of trees scattered or spaced across grassland (usually grazed or burned over periodically) is called a savanna. Most trees grow in forests. There are different types of forests around the world, mainly depending on the climate. Some main forests are identified below. Tropical rainforests grow near the equator, where the climate is constantly warm and the rainfall is heavy all year round. Almost all of the trees in tropical rain forests are evergreen broadleafs. They have a much larger variety of trees than the other types of forests and also support many other types of plants and animals. The largest tropical rain forests are found in South America, Central America, Africa, and Southeast Asia. Tropical seasonal forests grow in regions of the tropics and subtropics that have a definite wet and dry season each year and a somewhat cooler climate than the tropical rainforests. Most of their trees are broadleafs with some being evergreen and some deciduous, shedding their leaves in the dry season. Tropical seasonal forests are found in Central America, South America, Africa, India, China, Australia, and on many islands in the Pacific Ocean. 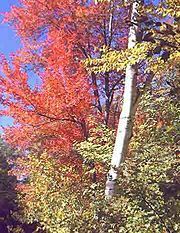 Temperate deciduous forests grow in regions that have a temperate climate with warm summers and cold winters. Most of the trees shed their leaves in the fall. Temperate deciduous forests are found in North America, Europe, and Northeast Asia. Temperate evergreen forests grow in some coastal and mountain regions. In most cases, their trees are conifers, but in Australia and New Zealand they are broadleafs. Temperate evergreen forests are also found in Europe, Asia, and North and South America. In the temperate evergreen forests, there are almost always some deciduous trees, and in the deciduous forests there are almost always some evergreens. 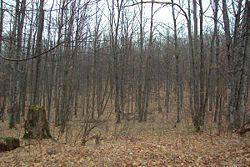 Some forests are classified as mixed deciduous-evergreen if the numbers of each are close to the same. Boreal forests grow in northern (the word boreal means northern) regions with very cold winters and short growing seasons. Most of their trees are evergreen conifers, with a few broadleafs such as aspen. Boreal forests are found in northern North America, Europe, and Asia. Savannas occur in a geographic region where there is not enough moisture to support a large density of trees. In savannas, trees grow individually or in small clumps with most of the land covered in grass or other low vegetation. Savannas are found in both tropical and temperate zones worldwide. Trees, like all plants, capture the energy of sunlight and through the process of photosynthesis convert it into chemical energy, which they use for their own growth and life processes. This energy is passed on, supporting a large community of living things. Many animals eat the fruits, seeds, leaves, sap, or even the wood of trees. On the forest floor, the fallen leaves decompose, thus supporting microorganisms, mushrooms, worms, insects, and other plants and animals. A layer of soil is built up and protected by the trees' roots. Besides food, trees also provide many species of animals with habitat, nesting space, and protection from predators. Trees help to modify the climate, providing shade in hot weather and shelter from the wind. In some places, they help to cause more rainfall and condensation of fog. The forest floor holds water from rain and snow, helping to lessen the effects of flooding and drought. Trees can also hold snowfall in place to prevent avalanches and slow the spring melt. From the beginning of humankind, trees have provided people with food, in the form of fruits and nuts, and wood for fires, tools, and shelters. Trees also shade homes and act as windbreaks to protect homes, and they help prevent soil erosion. Many useful products come from trees, including rubber, cork, turpentine, tannic acid (used for making leather), and medicines such as quinine. Most people also find trees beautiful, restful, and even inspirational. Perhaps because of their importance to people, trees have been often featured in folklore, mythology, art, and religion. In the Old Testament or the Hebrew Bible ("Tanakh"), trees provide symbolism in the form of the Tree of Knowledge and the Tree of Good and Evil. In Buddhism, the Bodhi tree is the one under which Siddhartha Gautama (Buddha) received enlightenment. The Bodhi tree belongs to the Sacred Figs (Ficus religiosa), which are sacred to Hindus, Jains, and Buddhists. In some religions, such as Hinduism, trees are said to be the homes of tree spirits. Trees of mythology include the Norse world tree Yggdrasil and the Austras Koks of Latvian mythology. In Norse mythology, the first humans were made from an ash and an elm. In Chinese mythology, there is a peach tree which grows one fruit every three thousand years, and the eating of the peach is to grant immortality. In Greek mythology, Eros makes Apollo fall in love with a nymph, Daphne, who hates him. As she runs away from him, she runs to the river and tells it to turn her into a tree. She becomes a bay tree. Deforestation. Since about the time of the beginning of agriculture and the domestication of animals, forests have suffered "deforestation," the loss of trees and conversion to non-forest, due to human activities. Forests have been cut down or burned to make room for farmland and villages. The grazing of sheep, goats, and other domestic animals killed young trees and turned forest into grassland or desert. As the human population increased, more trees were cut down for lumber and for fuel. By the 1800s, a large part of the world's forests had been lost. The process of deforestation is still going on in many parts of the world. About half of the world's forested area has been lost to deforestation. Biodiversity on a 15-year-old reforested plot of land. 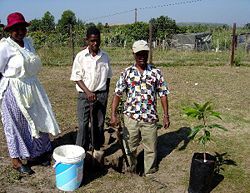 Conservation and reforestation. In the second half of the nineteenth century, the conservation movement began in the United States and other countries calling for the preservation of forests, along with other natural resources. In 1872, Yellowstone National Park was established as the world's first national park. The conservation movement spread over the world and today there are over 7,000 national parks, nature reserves, and wilderness areas worldwide, protecting an area about the size of the mainland United States, much of it forest. The effort to protect forests is ongoing especially for the tropical rainforests, which are mostly located in poorer countries, where there is much pressure to utilize forested areas for the needy and growing populations. Besides preservation, there is also a movement to replant trees and restore forests for both their environmental and economic benefits. This is being carried out by governments, by the United Nations, by non-profit organizations, by private landowners, and by concerned individuals in both rich and poor countries. The world's champion trees in terms of height, trunk diameter or girth, total size, and age, according to species, are all conifers. In most measures, the second to fourth places are also held by species of conifers. As a general standard, tree girth (circumference) is taken at “breast height”; this is defined differently in different situations, with most foresters measuring girth at 1.3 m above ground, while ornamental tree measurers usually measure at 1.5 m above ground. In most cases this makes little difference to the measured girth. On sloping ground, the "above ground" reference point is usually taken as the highest point on the ground touching the trunk, but some use the average between the highest and lowest points of ground. Some of the inflated old measurements may have been taken at ground level. Some past exaggerated measurements also result from measuring the complete next-to-bark measurement, pushing the tape in and out over every crevice and buttress. Modern trends are to cite the tree's diameter rather than the circumference; this is obtained by dividing the measured circumference by π. It assumes the trunk is circular in cross-section (an oval or irregular cross-section would result in a mean diameter slightly greater than the assumed circle). This is cited as dbh (diameter at breast height) in tree literature. Montezuma Cypress Taxodium mucronatum: 11.42 m, Árbol del Tule, Santa Maria del Tule, Oaxaca, Mexico (A. F. Mitchell, International Dendrology Society Year Book 1983: 93, 1984). 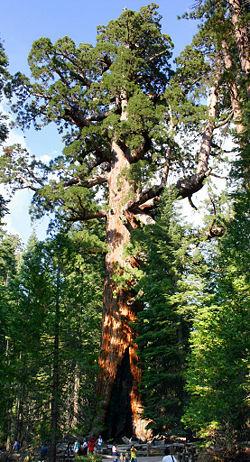 The largest trees in total volume are those that are tall, of large diameter, and in particular, which hold a large diameter high up the trunk. Measurement is very complex, particularly if branch volume is to be included as well as the trunk volume, so measurements have only been made for a small number of trees, and generally only for the trunk. No attempt has ever been made to include root volume. However, the Alerce Fitzroya cupressoides, as yet unmeasured, may well slot in at third or fourth place, and Montezuma Cypress Taxodium mucronatum is also likely to be high in the list. The largest broadleaf tree is an Australian Mountain Ash, the “El Grande” tree of about 380 m³ in Tasmania. The oldest trees are determined by growth rings, which can be seen if the tree is cut down or in cores taken from the edge to the center of the tree. Accurate determination is only possible for trees which produce growth rings, generally those which occur in seasonal climates. Trees in uniform, non-seasonal, tropical climates grow continuously and do not have distinct growth rings. It is also only possible to measure age for trees that are solid to the center; many very old trees become hollow as the dead heartwood decays away. For some of these species, age estimates have been made on the basis of extrapolating current growth rates, but the results are usually little better than guesswork or wild speculation. Other species suspected of reaching exceptional age include European Yew Taxus baccata (probably over 3,000 years) and Western Redcedar Thuja plicata. The oldest verified age for a broadleaf tree is 2,293 years for the Sri Maha Bodhi Sacred Fig (Ficus religiosa) planted in 288 B.C.E. at Anuradhapura, Sri Lanka; this is also the oldest human-planted tree with a known planting date. Aerts, R. 1995. The advantages of being evergreen. Trends in Ecology and Evolution 10(10): 402-407. Ewers, F. W., and R. Schmid. 1981. 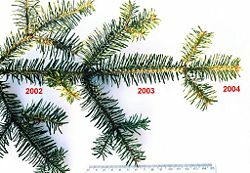 Longevity of needle fascicles of Pinus longaeva (Bristlecone Pine) and other North American pines. Oecologia 51:107-115. Matyssek, R. 1986. Carbon, water and nitrogen relations in evergreen and deciduous conifers. Tree Physiology 2:177–187. Sobrado, M. A. 1991. Cost-benefit relationships in deciduous and evergreen leaves of tropical dry forest species. Functional Ecology 5(5):608-616. This page was last modified on 8 June 2008, at 18:58.